With confident, fearless direction by newcomer Ryan Coogler and a charismatic performance by Friday Night Lights alum Michael B. Jordan, Fruitvale Station is a somewhat overlooked film that needs to be reckoned with. It is based on a true story told in 2008 of one Oscar Grant. He was an unemployed, drug dealing, doting father who on the last day of his life, decided to start from scratch and become a better person. Unfortunately and with great tragedy, he gets shot and killed by an Oakland police officer on New Year's Eve. This happening, which seemed accidental and overwrought, was committed on a subway stop carrying the same name as the aforementioned title of this harrowing, Cannes Festival vehicle (the one I'm reviewing). "Station", taking place during a one day period, is short and to the point. At less than ninety minutes, things unfold and end in the most conventional way possible. As powerful and naturalistic as it is, I only wish that the proceedings lasted a little bit longer. I wanted the outcomes of the guilty police officers involved, to pan out. I wanted to get the family's point of view after a possibly accidental hate crime was committed, and I ultimately wanted more closure in general (as opposed to some ending credit titles explaining every one's eventual plight). Now don't get me wrong, I still think that Fruitvale Station is an excellent medium of non-fiction exploitation. I especially enjoyed the real life sequence at its conclusion showing the actual characters mourning the life of Grant (in a yearly ceremony and tribute). But what kept me from giving this thing the highest accolade possible was the length. It would've helped if an extra 20-25 minutes of running time was tacked on. Then what you'd have would be a full blown masterpiece. What's on screen kinda echoes a sort of Rodney King-like foretelling where the actual events that occurred, triggered protests and insight from the community. Again, those images are not really shown during the film (there is only documentation of what happened in the closing credits). If a few extra scenes were added, "Station" as a movie, could have formed an even fiercer trajectory plan. Minor flaws aside, Coogler who I mentioned earlier, has an extreme prowess for such a rookie embattled director. He carries you masterfully through scenes that involve Grant's fateful day. His storytelling technique involves the act of showing various cell phone calls and text messages in their exact wording on screen. There is even a "caught on camera" snippet of what really happened (it's at the beginning and was recorded by I guess, some one's iPhone). Also, there is one flashback sequence involving Oscar's past incarceration. And throughout, there are thoughtful, tender moments of him embracing his young daughter's needs and wants. As an Audience Award winner at the 2013 Sundance film festival, "Station" might be too small scale to take over the Academy. However, there is never a false note involving the pacing, the acting, and the genuine authenticity of Oakland, California's locality (I've never been to Northern California but after viewing this film, I almost felt like I was actually inhabiting its surroundings). Michael B. Jordan who takes on the title role, has an uncanny level of screen presence here. His actions project a sincere likability, a misunderstood mindset, and a twinkle in his eye (that of a future movie star). His character's most pivotal scene involves the discarding of a huge bag of pot (into the San Francisco Bay) that he was planning to sell to make ends meet. He wants to do things the right way, start fresh, and rise to an impressionable status. When he loses his life in "Station" (at a ripe 22 years old), the feeling stays with you (as the viewer) and haunts you long after you take it in. Overall, I can't think of a release in 2013, that's more confident, more sure of itself, and more brilliant in its casting. Octavia Spencer is a powerhouse playing the part of Grant's mother and Melonie Diaz is sympathetic as his forgiving girlfriend. 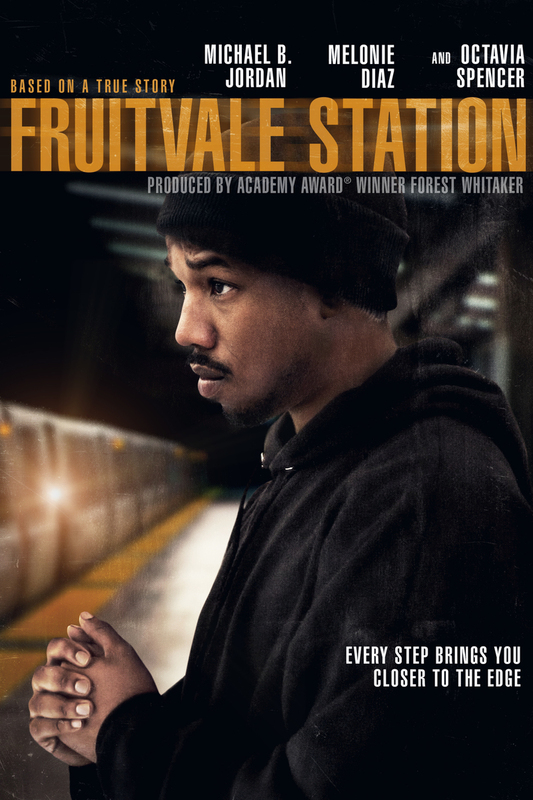 Yes it's true that Fruitvale Station may have been passed up at this year's Oscars. But it has been praised by almost every critic and filmmaker alike (Spike Lee hailed it as the best film of the year). So now that it's on DVD, check out this mature, masterful debut from a born auteur like Coogler. It's a true story adaptation that pretty much gets it right.